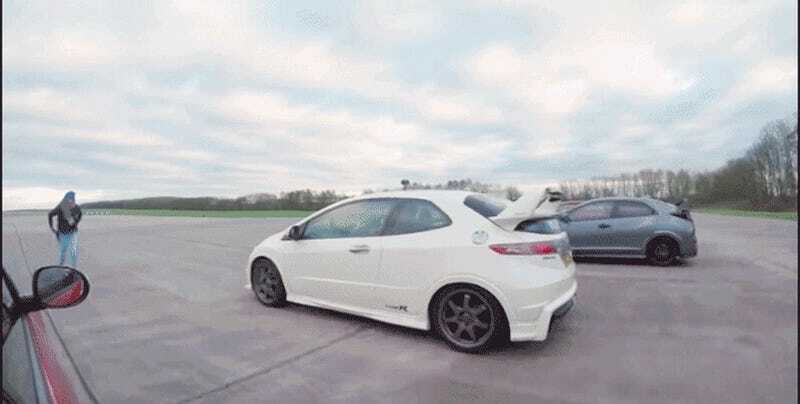 This quick video from Carwow over in the UK put together the four most recent Civic Type R generations, plus a special edition Mugen FN2 for good measure, to compare them all in one big head-to-head comparison. While we didn’t get any of these Type Rs except the most recent FK8 generation, it’s still quite an interesting look at Honda’s forbidden fruit Civic. The competition is made up of several rounds, beginning with a five-car drag race from a standing start, which provides mostly unsurprising results. The rolling drag race is a little more interesting, but it’s the braking test from 70 mph is perhaps the most surprising. On the short road course test, Mat Watson conducts a simple subjective classification of each CTR, that standard FN2 was his least favorite to drive with a twist beam rear axle and a disconnect between the driver and car not felt in the other models. It might be nostalgia speaking, but Mat ranks the EP3 as his favorite of the bunch, because it was the one that had just come out when he first got into car reviewing. I think I agree with him, if I’m honest. The EP3 is the slowest, has the comparative worst braking, and is one of the slowest around the track, but it’s the coolest design and the most connected driving experience. That speaks volumes. Which of these Civic Type Rs is your favorite?